I have loved horses my whole life. Intuitively as a child I knew the healing power of animals. When I realized growing up in the suburbs of Chicago a horse would not be in my near future, I begged for a dog. When I graduated high school I drove west until I found a barn and said “I want to learn about horses!” And I did and worked with horses for about 2 years. Living on an estate caring for the horses and working at local barns. Throughout the years, I have had friends with horses and was able to ride. I have been in the chemical dependency field and outdoor experiential learning since 1993. I love the outdoors and nature and to go the next step to include animals was a natural for me. I have a beautiful bernese mountain dog Murren, who is a therapy dog. 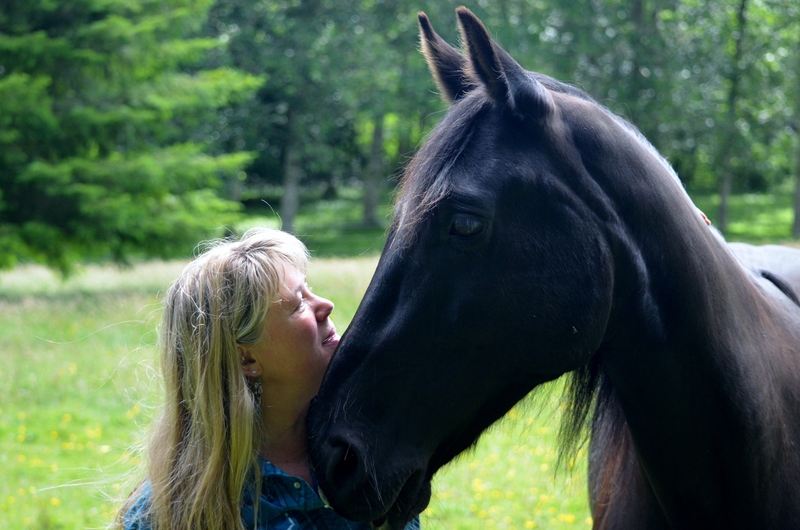 I knew horses were next, and had the good fortune to be lead to Melisa Pearce and her Equine Gestalt Coaching Method Certification Program, which I graduated from August 10th, 2012 as a certified EGCM coach!I have also had the good fortune to bring Sweetness and Ben into my life, who are both powerful healers! I am practicing with fabulous results!